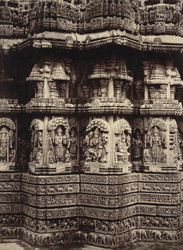 This photograph of the Prasanna Chennakesava temple, Somnathpur taken in the 1890s by an unknown photographer, is from the Curzon Collection's 'Souvenir of Mysore Album'. The Keshava Temple at Somnathpur near Mysore, completed in 1268, is one of the best preserved of the temples built in the Hoysala period. Dedicated to Keshava, the god Vishnu under his three aspects, it consists of three shrines approached through a pillared mandapa. On the outer walls of the temple, at the lower levels, there are friezes with elephants, horses, makaras (mythical sea-creatures), geese and foliated scrolls. Then, a procession of gods richly encrusted with jewels and ornaments is set in the various projections of the walls created by the stellate plan of the sanctuaries. Above the panels, pilasters support miniature towers and an angled eave with a fringe projects above.